I was so thrilled to see this project on Kickstarter a few months ago. 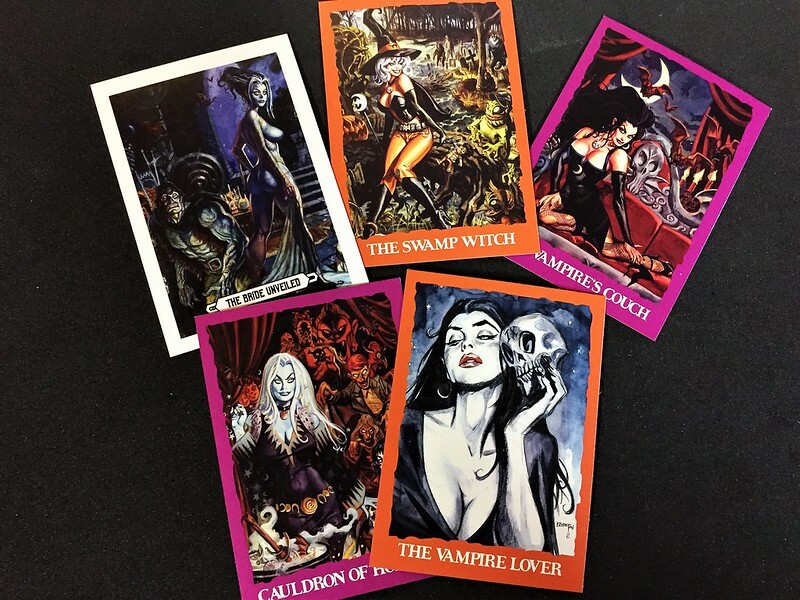 I've been a fan of Dan Brereton for a long time now after discovering his comic series The Nocturnals. It's not only gorgeous to look at but the atmosphere is what I can only call Halloween Noir. Image Comics recently made The Nocturnals available digitally so if you want to check it out, go here. If you prefer having it in hand, you can probably find them at a local comic shop or Amazon. 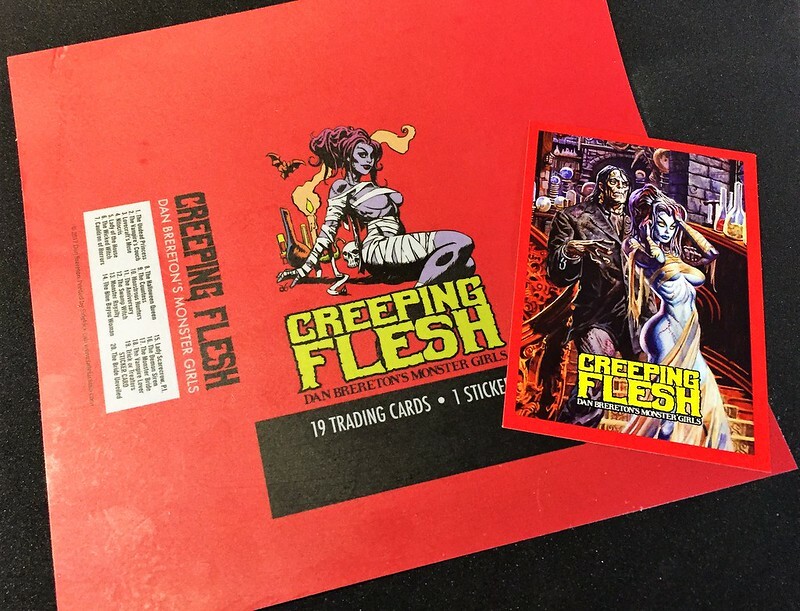 But enough about the comic, I'm here to talk trading cards! 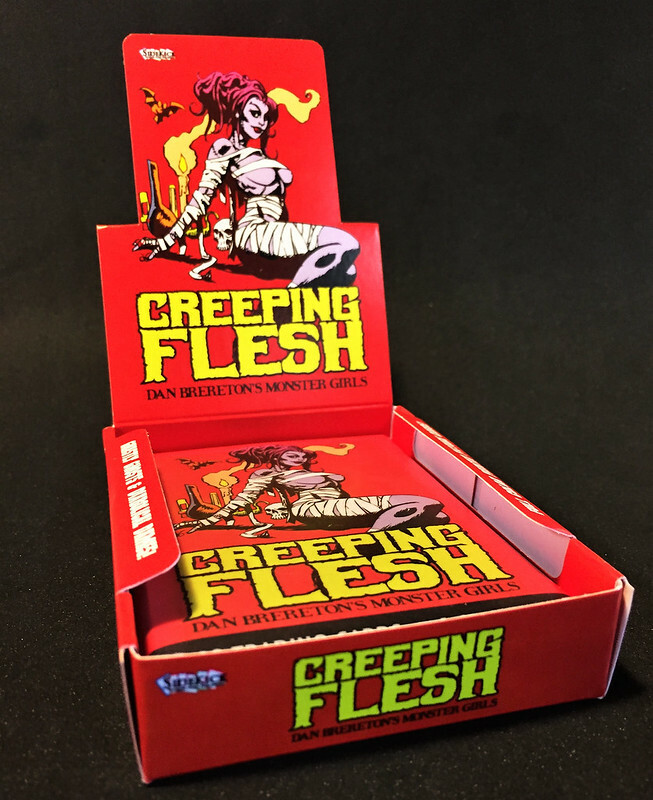 Creeping Flesh is a set of 19 monster girl trading cards and 1 sticker. 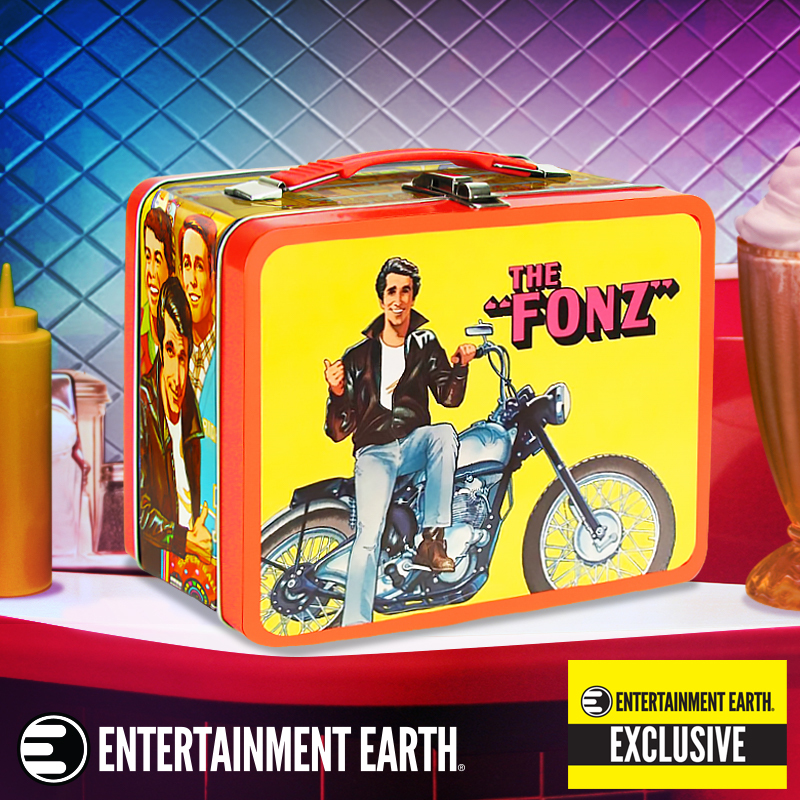 It's presented as a wax pack of trading cards straight out of the 80s, but instead of having to buy a ton of packs, you get the whole set in one shot. They did an incredible job with the presentation. For a few bucks more, you could add on this display box to hold the pack of cards. Anyone that remembers buying cards back in the day may get a nostalgia flashback. Just like the store boxes, the top folds back with a cut out image. That's the pack of cards inside it to give you an idea of the size of the box. They come in a wax wrapper too. 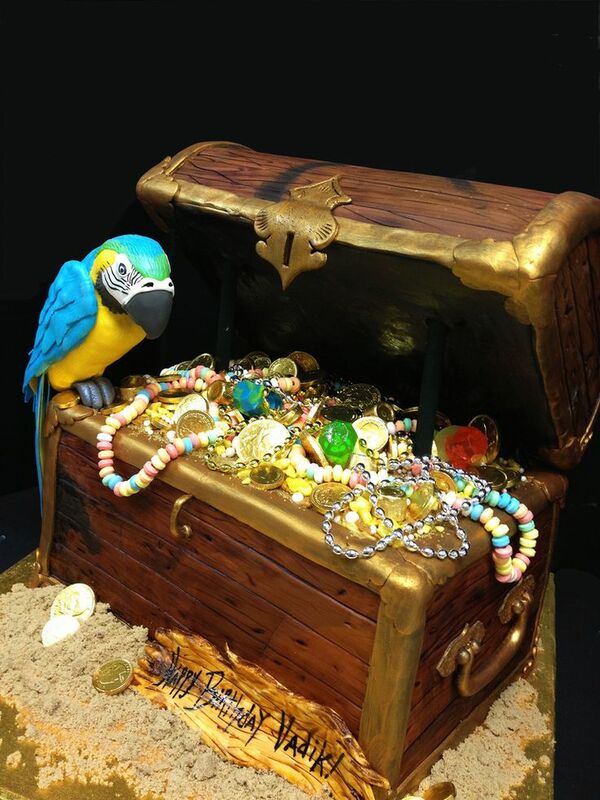 The only thing missing is a stick of gum which is probably for the better. In addition to the wax pack the cards come in, they sent a flat wrapper. Something they didn't have to do but it's a nice bonus. The left side has a checklist of the card set. Also included is a promo card for the set. Here are just a few of the 19 cards. The one with the white border is the sticker card. The regular cards are either orange or purple bordered giving the set even more of a Halloween vibe. As you can see, Brereton has a wonderfully spooky art style. 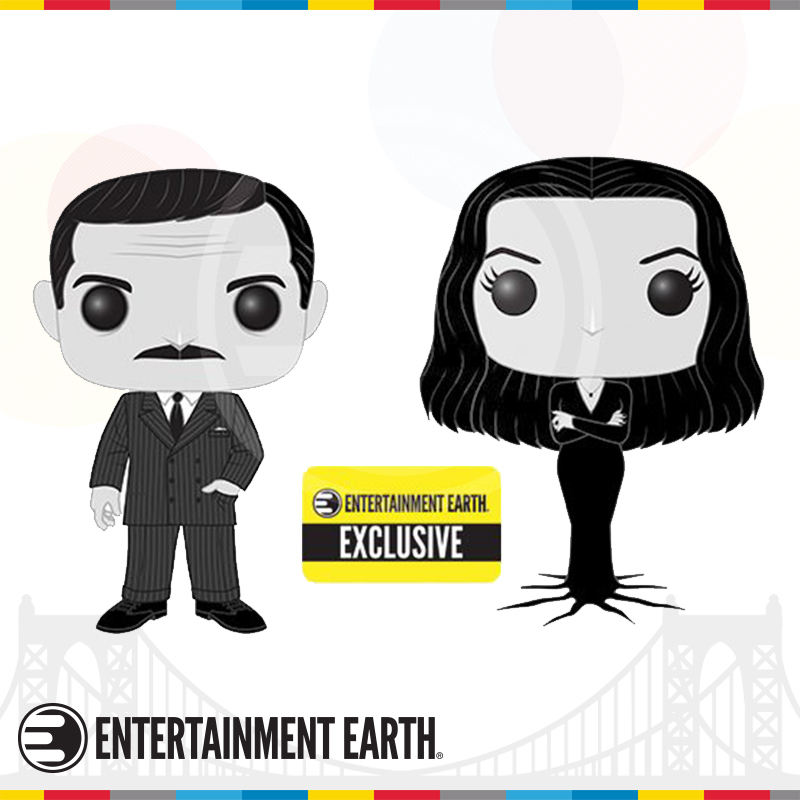 If you want to snap up a set of these wicked women, they have about 60 sets left. There are also add-ons you can get like the display box, signed cards (why didn't I order one of those? ), or even a collector's set with each card autographed! Drag yourself over to Sidekick's site to order. After months of scouring the pegs, the Milano has finally landed! I don't know if everyone else finally got one or if I got lucky and walked in shortly after a fresh case was put out, but I counted at least three of these. I snagged two of them so I could keep one carded. I knew if I only got one, I'd regret opening it and ruining the card art and for a buck each? Why not. 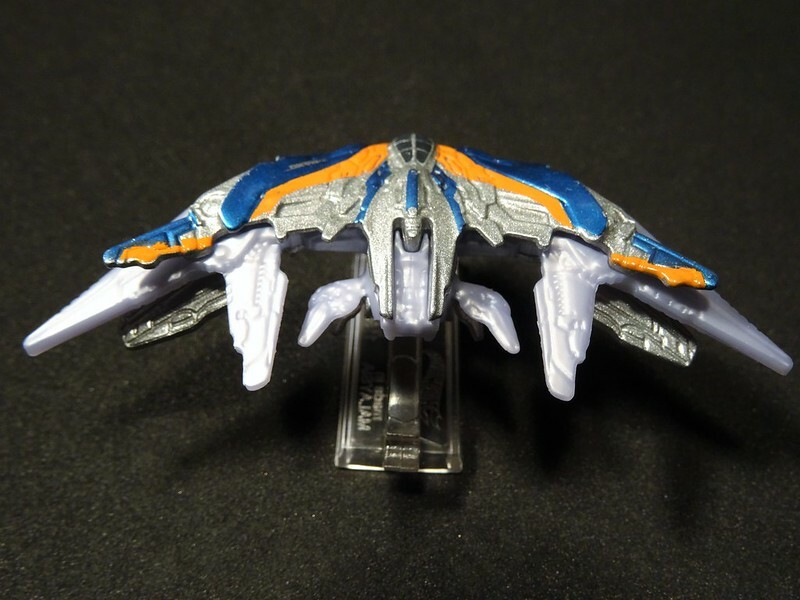 It comes with a little clear plastic stand so the ship can be displayed in flight. The paint job is pretty good. You can't see from this angle but they did skimp a little on the underside along the nose by leaving out the orange, but hey, for a buck I'll live with it! 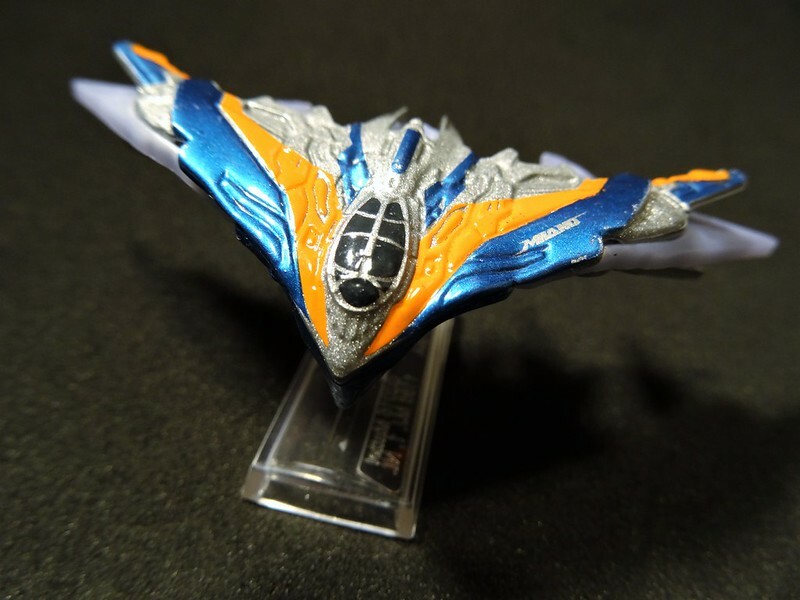 Something pretty cool that I didn't notice until looking at the pics: the name of the ship on the left wing! Or maybe it's port. Am I supposed to use port when referring to a spaceship? The flaps (I don't know what they're actually called) are done in plastic but the rest of the body is die cast. The particular color of plastic used is a little off to me, I think it's the almost pearlescent sheen. But again, for a dollar it looks pretty great on display. Side note: my spell check didn't have pearlescent as a word, what up with that? 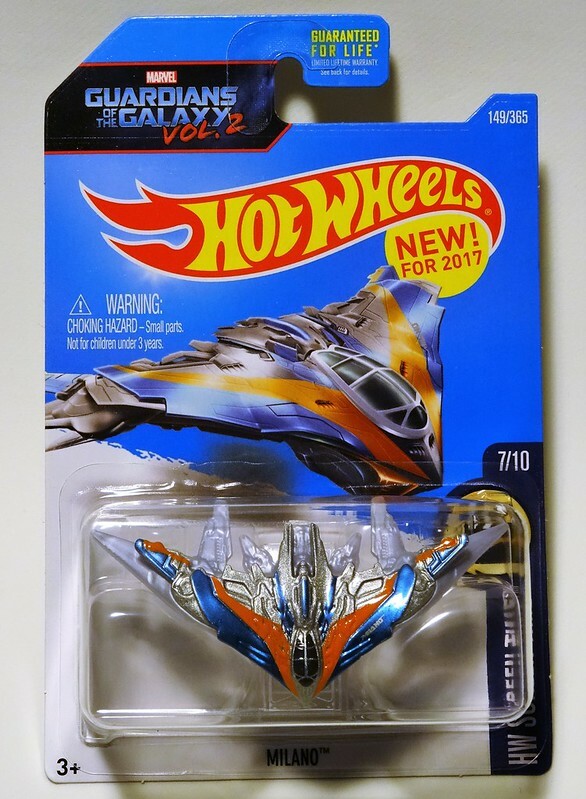 I don't imagine we'll be getting Hot Wheels of any other ships but there is a new set of Volume 2 character cars out there featuring Yondu, Nebula, Mantis, and a new Groot go-kart. They also re-released the originals on Volume 2 cards. As far as I've seen, Rocket is the only one that is different from the original release with a repaint in blue to match his new outfit. Aside from the TRU exclusive Rocket/Groot 2-pack, these have been difficult to find in my local stores. I have managed to grab Groot and Yondu and am still on the hunt for the rest. Well, unless your name is Kevin of kapgar.com, nope! Congrats to Kevin and thank you everyone that stopped in for the contest. July 13th marks the sixth year this ol blog has been...uh, blogging? I totally forgot about it last year which is too bad because as a society we're obsessed with nice round numbers. You hit a five year anniversary it's all cake and fireworks. Six years? Eh, let me know when it's 10. Astute readers will not it is not yet July 13th. This is going up a day early because tomorrow night I will be rocking out to Boston and Joan Jett! Since I missed the big 5-iversary, I'm doing a giveaway to thank the readers. But we'll get to that in a bit, or you can just skip down. First, I want to share some totally meaningless stats. 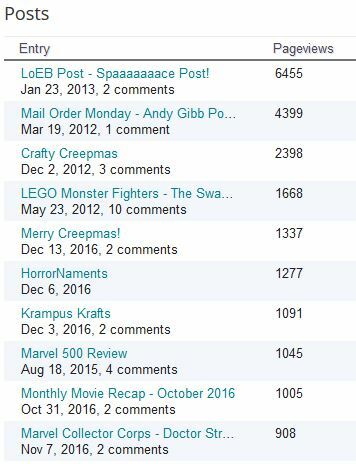 Here are the most viewed posts over the last six years. 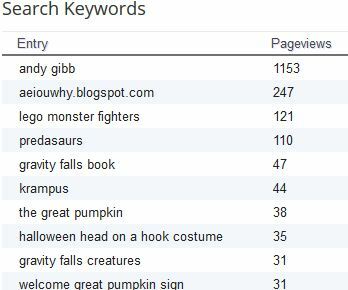 Shockingly, Andy Gibb has dropped to the second spot! 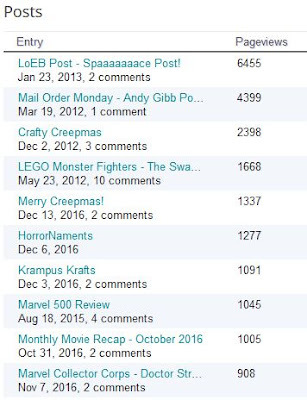 For the longest time, that was the most viewed post. 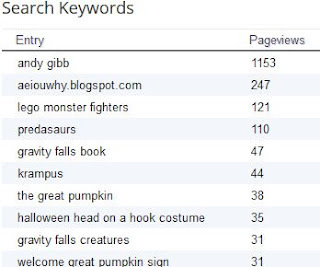 Here are the most searched terms that lead people here. It will contain items from Loot Crate and other things. How do I know I'll like the stuff? B: You can throw me a couple of keywords and I will try to put related stuff in the box. Leave a comment below with your keywords. It's as easy as that. Leaving congratulatory words and/or well wishes will not increase your chances of winning neither is it discouraged. If you're into horror movies and/or random geeky t-shirts that are Men's XL (never worn, don't worry!) mention that as well. MOST IMPORTANTLY: make sure I have a way to contact you from your comment. If your email is linked to your commenting account, you're good. Otherwise, include an email, Twitter, or GPS co-ordinates in your comment. Also, and I'm sorry to say, contest open only to US residents. Unless you want to pay shipping for a box o stuff, then join in! Winner to be determined on Monday, July 17th. As a kid of the 70s, I got a lot of exposure to Spider-Man. He appeared in segments on The Electric Company, reruns of the 60s cartoon (the one with that catchy theme song), and then there was the live action incarnation on TV. But what kid-me had no way of knowing for decades was that there was another 70s live action version going on around the world in Japan called Supaidaman! Prepare yourself for awesome and check out the show's intro. Although the lyrics are in Japanese, the song is ridiculously catchy. You've been warned! As you can see, Japan put their own twist on the spider story we're all know. Supaidaman would actually become the basis for the Super Sentai hero series which evolved into Power Rangers. The origin of this version of Spider-Man is completely different than the one we're used to. Takuya Yamashiro finds a dying alien from planet Spider who injects him with his blood (giving him spider powers) and bestows on him the bracelet that holds the costume, shoots webs, and controls the giant robot Leopardon. You didn't think you'd get a Japanese hero show without a giant robot, did you? Supaidaman frequently had a monster of the week which would start off man-sized and then grow to a Godzilla-size for the big showdown, which is when Leopardon would be summoned to battle the giant menace. As a kid, I spent many a Saturday afternoon glued to the TV watching Creature Double Feature on WLVI 56. In addition to featuring horror and scifi from the 50s-70s it was a good bet at least one of the movies would be something in the Godzilla realm. And that's probably why I love Supaidaman as much as I do. From the guys in giant monster suit fights to the sound effects, every bit of this show takes me back to being a kid. Oddly enough, I have never seen a complete episode of Power Rangers. Marvel.com had posted the episodes years ago but sadly they've since been removed. Clips are easy to find but not so much full episodes. I did manage to find them on the web (ha!) elsewhere and have watched a little more than half of the 41 episodes. I can't recommend this show enough! If you can find it, watch a couple of episodes to get a feel for it. 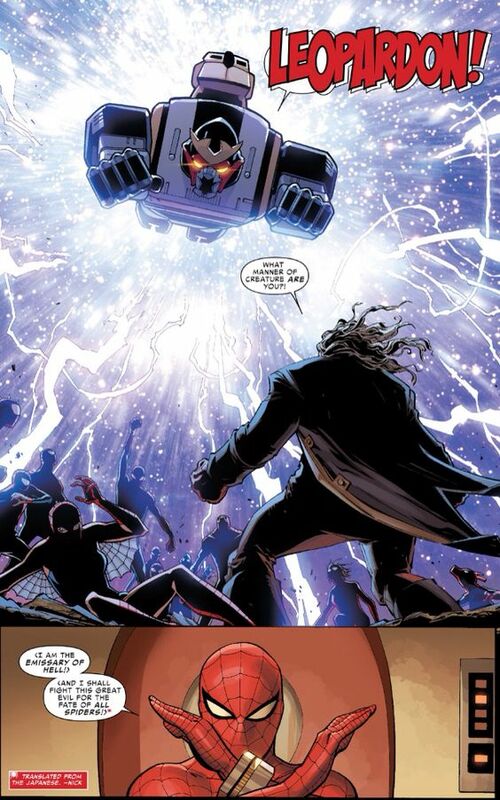 In the recent Spider-Verse mega-event, Supaidaman finally made his way into Marvel canon from a different universe. It was a great treat for me, as it was right out of the show. For whatever reason, the whole "emissary from hell" thing is one of my favorite bits from the show. Maybe because it's just so not Spider-Man and weird. Supaidaman sure knows how to make an entrance! Here we are at the half way point for 2017. It is just flying by! I'm seeing tons of buzz and recommends for Baby Driver so I may have to check that out. If you've seen anything good lately, drop a comment below! Quick reminder: the linked movie titles will take you to Amazon where you can purchase it, or anything else, and drop a few pennies in the blog coffers. Hopefully an indication that DC is starting to head in the right direction, this movie is a lot of fun! There was a lot of great stuff here, especially anytime Diana is fighting for the common people. We need a hero that inspires! Cool: I need an entire movie of young Diana, that girl was great! Lame: I didn't quite get everything going on in the final showdown. Was the power coming from the bracelets or her because she's a demigod or...? Cannot take any villain seriously with that mustache. Sometimes you just find things on Netflix and dive in with nothing more than a couple sentences of summary. I had no idea what I was getting into! This is the kind of grindhouse midnight movie I absolutely love because it is so off the wall. You can hardly go wrong if there's nuns with shotguns. Cool: While watching it, I thought it would make a great comic book, turns out it's based on a comic. Lame: It's a little uneven in places but not really a bother overall. And sometimes you find something on Netflix that sounds like fun and it turns out to be a Hallmark movie. Not that it's terrible, I just wasn't expecting it to be a kids movie. I think 13 year old me would like this. If I had watched the trailer first, I probably would have skipped it. Cool: I like the premise so maybe I'll check out the books it's based on. Lame: It's just too by the book. The trailer makes it look halfway decent, what it doesn't tell you is that the main characters are going on space spring break when their ship crashes unexpectedly. If that doesn't trigger a warning flag, I don't know what will. I can't be bothered to look up the actual age of the actors but I'm guessing their average age is late 20s/early 30s. Cool: For low budget, the effects and armor suits are really well done. Guess that's where all the money went. I've never been a big fan of the original cartoon or the look of the current movie incarnations. Having said that, this was a great improvement for me over the first movie. I actually had fun watching it instead of being appalled at the sexual innuendo. It's a great live action cartoon! Cool: Krang was fantastic! Megan Fox was adequate! Lame: Why put Casey Jones in if you're barely going to have him BE Casey Jones?